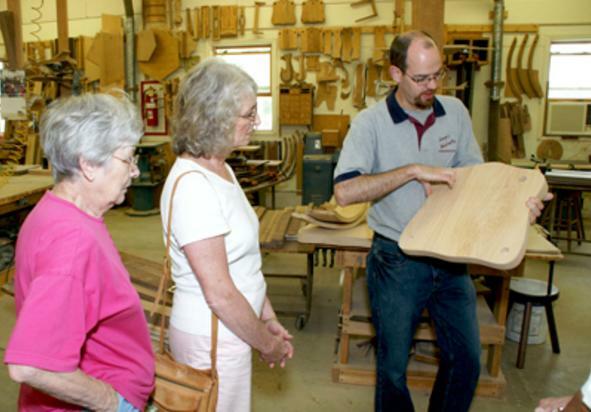 For a fun and informative experience, we invite you visit us and take a guided woodshop and showroom tour. See first-hand how George's Furniture is handcrafted by skilled craftsmen. It's an experience you will always remember. 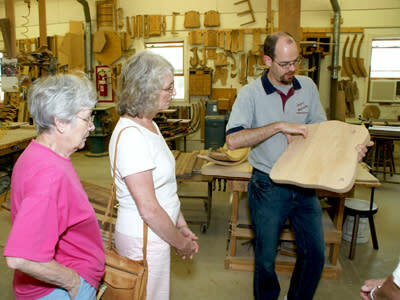 We give personal tours of our woodshop and two showrooms. Tours starts in our main showroom building. WHEN - Woodshop/Showroom tours are available Monday - Thursday, 9 a.m. to 4 p.m, Friday 9 a.m. to 2 p.m. The showroom is also open on Saturdays. Children are welcomed. In fact, we have a play area, fishpond, and two swans that stay with us year-round. We do suggest you keep a safe distance away from them while exploring the property. No reservations are required for groups under 10 people. Groups of 10 or more should call ahead 1-800-799-1685. We charge $3.00 per person for our tours. Monday Hours: 9 a.m. - 4 p.m.
Tuesday Hours: 9 a.m. - 4 p.m.
Wednesday Hours: 9 a.m. - 4 p.m.
Thursday Hours: 9 a.m. - 4 p.m.
Friday Hours: 9 a.m. - 2 p.m.